The Turkish army imagined a military strategy like a Russian doll. The official purpose of the operations that have just begun is to fight the jihadists. 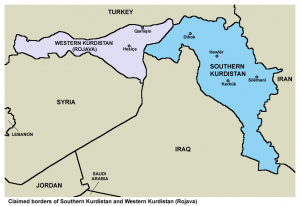 In actual fact, the real purpose of leading these operations is to prevent the creation of new states – the Rojava (see map) and Kurdistan. 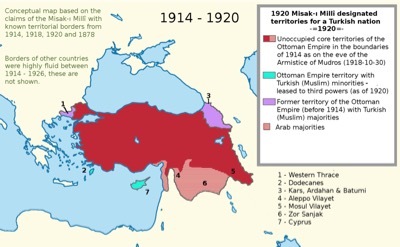 The operations are also masking the possible implementation of the national oath of 1920 with the conquest of North East Greece, the entire Island of Cyprus, Northern Syria and Northern Iraq, the conquering of former territories publicly demanded by President Recep Tayyip Erdoğan. 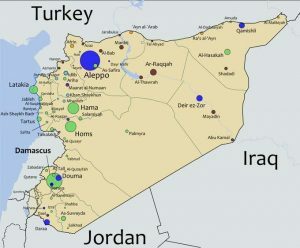 Following an agreement concluded between Russia and Turkey during the most recent Astana negotiations, the Turkish army entered the governorate of Idleb (see map), violating Syrian sovereignty, in order to combat the jihadists there. the Syrian Turkmen, which it had gathered under the flag of the former Free Syrian Army (FSA) and which it intends to use as a support in the region. the Jihadists that accept to continue their fight in South East Asia and which should be transferred there by Turkish Secret Services (MIT). all the others, which should be eliminated. Furthermore, the Turkish army already occupies Al-Bab (see map), also violating Syrian sovereignty. The Turkish presence at Idleb cuts the Rojava’s access to the Mediterranean Sea. Its presence at Al-Bab offers it the possibility of cutting the Rojava into two and wiping out this pseudo State. Turkey, Iran and Iraq had met to deaden the vague hopes of an independent pseudo Kurdistan. The Barzani family and Israel have gradually swallowed up territories thanks to local conflicts and war. In 15 years, the territory administered by the Barzanis and Israel under the name “Iraqi Kurdistan” has multiplied its areas by fivefold to the detriment of the native, Arab and Christian populations. On 25 September 2017, the Barzani family and Israel organized a referendum on independence. Following a vote that was largely rigged, especially in the Christian areas, the yes vote reached 92 %. 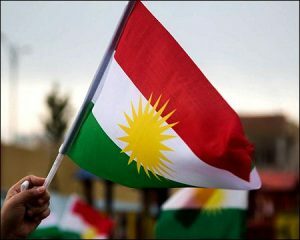 During a popular festival, the Barzani family, brandishing Kurdish and Israeli flags, announced that the process for independence was irreversible. The journal Kurds-Israel revealed that an agreement had been concluded between Tel-Aviv and Erbil providing for 200,000 citizens to be transferred to the “Kurdistan”, once independence had been declared. The Israeli army intends to promptly station missiles there to threaten both Syria and Iran. The pipeline linking the pseudo Kurdistan to the port of Ceyhan (Turkey) will be closed by BOTAŞ, the Turkish public operator which owns it. Accordingly, the Barzanis’ oil revenues will be cut. Currently, Kurdish oil is chiefly exploited by the French company Total. It is sold in the European Union, Ukraine and Israel where it represents almost the entire domestic consumption. The Turkish and Iranian air space will be closed with the pseudo-Kurdistan. Taking account of the war, Syrian air space is not practicable for civil flights. Flights from and to Erbil will necessarily have to pass through Bagdad. The border-posts between Turkey and Iran on the one side and the pseudo Kurdistan on the other will all be closed, thereby cutting custom revenues of a potentially new state. So as to maintain Turkish-Iraqi trade relations, a new route will be open along the Syrian-Iraqi border permitting Ankara to be linked up to Bagdad. The Iraqi army will station 13,000 men to guarantee its security, whilst the construction works for a new pipeline along this route will begin at once. This route will cut communications between the pseudo-Kurdistan and the Rojava. Since 2015, the Turkish army has been occupying Bachiqa (the pseudo-Kurdistan), thereby violating Iraqi sovereignty. An ultimatum (by 1 November at the latest) will be addressed to the Barzani family preventing it from announcing independence. In case it refuses, the Turkish army is preparing to declare war against the pseudo-Kurdistan. It would make a two-pronged attack on Erbil, from the Turkish border on the one hand, and from the new route that has been secured by the Iraqi army on the other hand. In 1920, Mustafa Kemal Atatürk, the founder of the Turkish Republic, drafted a national oath challenging the winners of the First World War and claiming the annexation of new territories for the Muslim populations whether they were in the majority or minority. 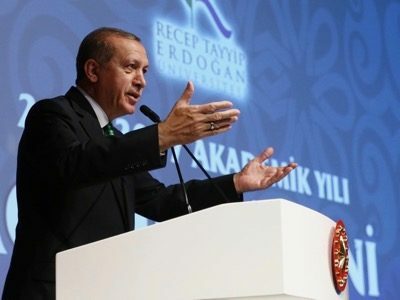 Three months after the assassination attempt and the coup d’etat were aborted in July 2016, President Recep Tayyip Erdoğan delivered an inaugural address at the university which bears his name (RTEÜ). He then provided a glimpse into the ambitions of the Turkish Republic following its creation and those of the new regime. Making explicit reference to “the National Oath” (Misak-ı Millî), adopted by the Ottoman Parliament on 12 February 1920, he justified conquering former territories. This oath, which lays the basis for the passage of the Ottoman Empire to the Turkish Republic, claims the territory of the North East of Greece (Western Thrace and the Dodecanese), the whole of Cyprus, Northern Syria (as well as Idleb, Alep and Hasakah), and Northern Iraq (including Mosul). In 1939, France only granted Hatay (Syria) to Turkey. Paris was also hoping that Ankara would get rid of its orthodox Christians which have their patriarchal base in Antioch. Having counted off these territories one by one, President Recep Tayyip Erdoğan is claiming them in his turn . President Recep Tayyip Erdoğan is the only Head of State of a developed country to challenge the international order and to publicly claim, where necessary by force, new territories. Thierry Meyssan is a political consultant, President-founder of the Réseau Voltaire (Voltaire Network). Latest work in French – Sous nos Yeux. Du 11-Septembre à Donald Trump (Right Before our Eyes. From 9/11 to Donald Trump). “’We Are Present in the History of Mosul”, Presidency of the Republic of Turkey, October 15, 2016.